This is our newest deluxe cabin at Luther Village. Elk Haus accommodates 8 comfortably, with an option for 2 more on the living room futon. There are 2 bedrooms - double bunk beds (4) in each room. The 3 piece bathroom includes a corner shower. The large open dining room, kitchen & living room overlook the large wooden deck that overlooks the lake. This self-contained lodge is one of the Cadillacs of Luther Village. 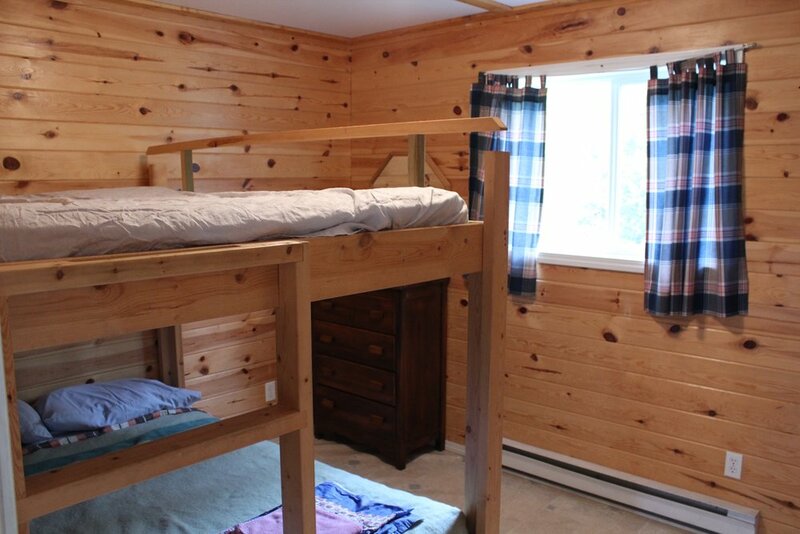 Beaver Lodge has 6 bedrooms: two with 2 single beds and four with a single bed and a bunk bed (for 3). There is a fully furnished living area with several couches and lazy-boys. Beaver Lodge also has 2 full washrooms with toilets, sinks, and showers. Cooking is no problem either as there is a full kitchen with stove, two fridges, microwave, and coffee maker. 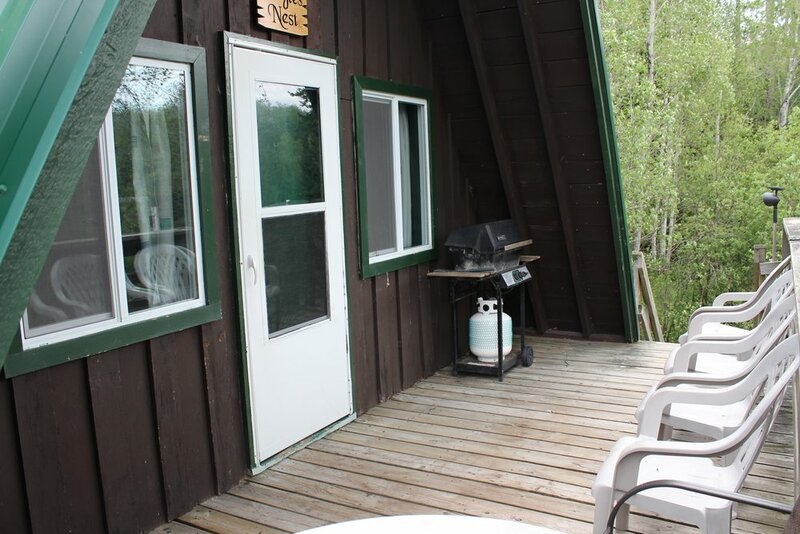 For those of you that like camping in the cooler months Beaver Lodge has a wood-burning stove for the added coziness that everyone should have at the lake! Maximum capacity of Beaver Lodge is 16 people and it is handicapped accessible. Luther Village has 5 A-Frame Cabins. All are the same inside and they are located all over the camp property. 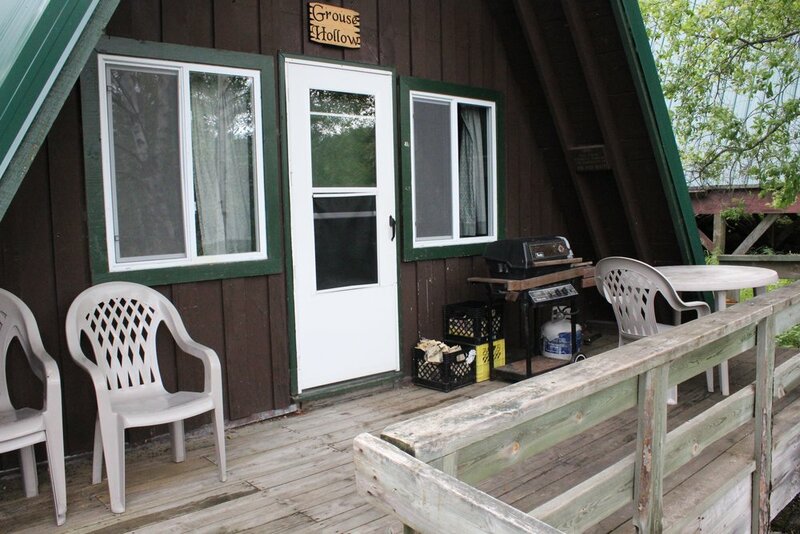 Each A-Frame has a fully furnished living area and a washroom with sink and toilet. 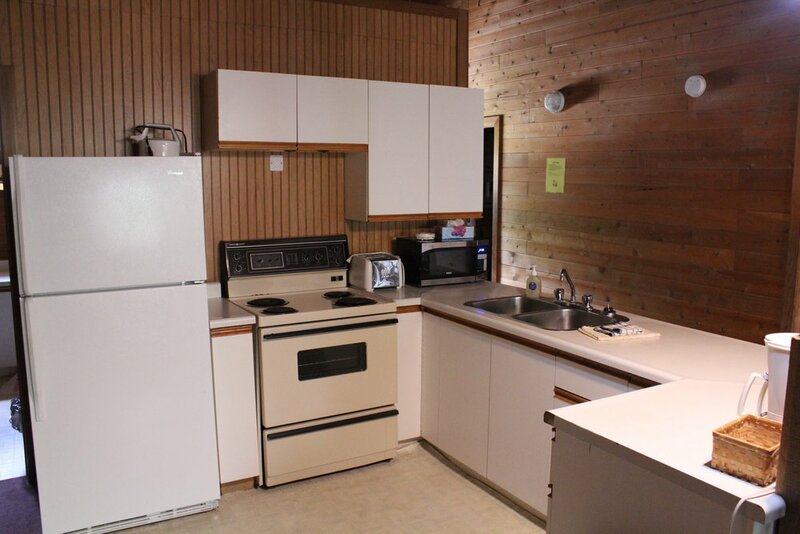 The kitchens have a stove, fridge, microwave, and coffee maker. There is a loft in each A-Frame with 3 single beds and a bedroom on the main floor with 2 single beds, not to mention the hide-a-beds that are in the living room. Maximum capacity of an A-Frame is 7 people. This duplex style building is perfect for couples or small families. The sides are mirror images of each other. 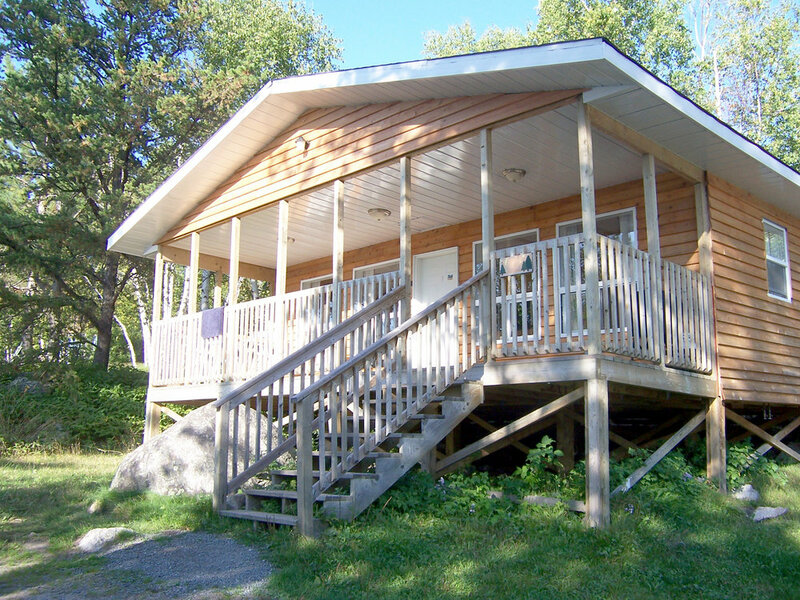 Each side has a fully furnished living area with a hide-a-bed; kitchen with stove, fridge, microwave and coffee maker, and washrooms with shower, toilet and sink. There is a bedroom with two single beds. The twin Pines has a large wooden deck overlooking the lake - perfect for an evening BBQ! Maximum capacity of each of the twin Pines is 4 people. These rustic cabins are the old fashioned one-room style. Built in the early 1940's, the log cabins have no running water, but there is electricity. These cabins have undergone a huge facelift in 2005/2006. 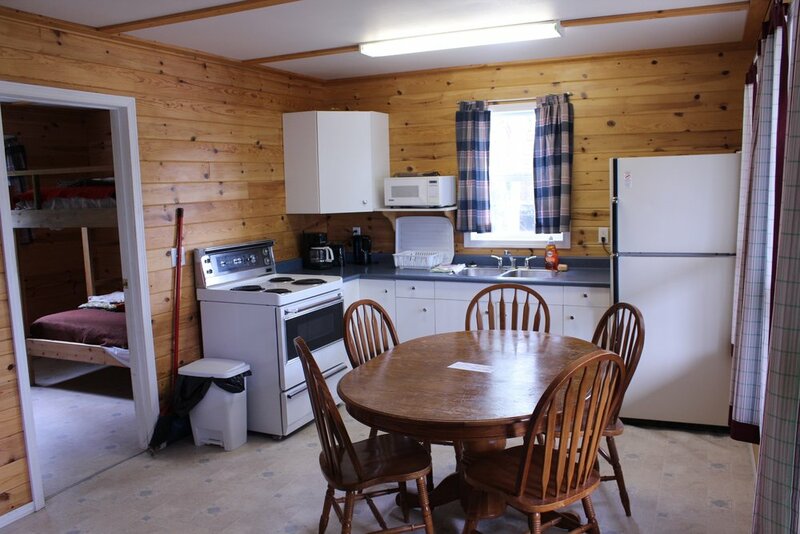 They have mini kitchens with microwaves, coffee makers, propane hotplates, and a full-sized fridge. They each have 1 double bed and 2 to 5 single beds. The other added bonus to the log cabins is the fully screened front porch that looks out over the lake - great for viewing sunsets over Dogtooth Lake! Maximum capacity of the Log Cabins is #1: 4 people and #2: 7 people. Dormitory style building. Ten rooms, all with 2 single beds - perfect for school groups or work retreats. Two full washrooms (men's and women's) with two toilets, sinks and showers. Maximum capacity is 20 people. No cooking facilities. Next door to the Chalet is Wolf’s Ridge. 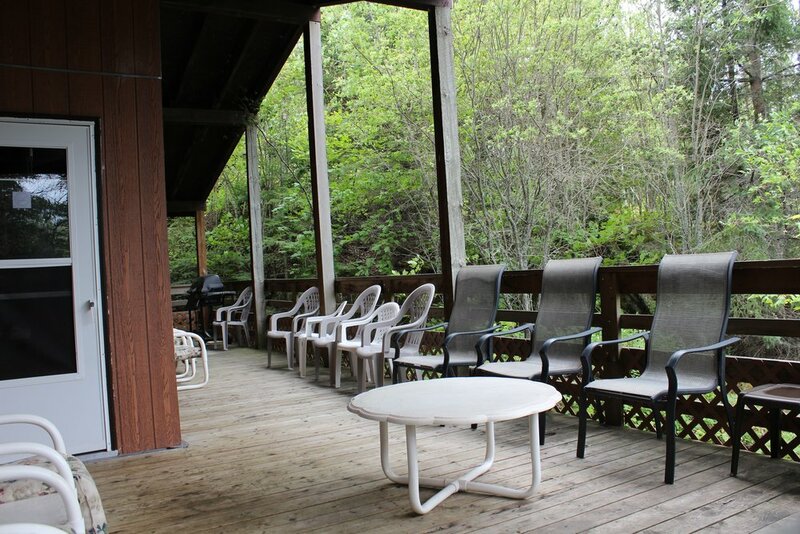 This building is a youth games room/ large meeting area with a deck overlooking the lake. It is furnished with couches and chairs, has a small kitchenette and bathroom, and is equipped with an easel, a TV and VCR/DVD player. Indoor games such as foosball, air hockey, shuffleboard, card table are inside. Capacity of Wolf’s Ridge is approximately 40 people.